Bubby is the only plush�toy that is washable. Parents don't need to worry�if Bubby gets dirty after playing with it in the yard or if some food was spilled on it. 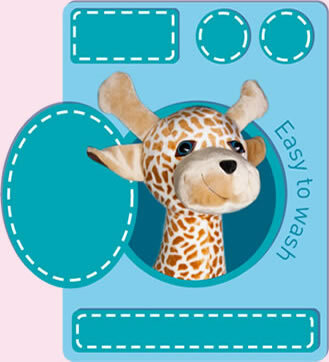 It�s easy to clean and wash � which is perhaps Bubby�s biggest advantage over any other plush toys currently in the market. Open the zipper and locate the air valve. Empty the air (recommended by using the deflating option of the air pump). Remove the PVC bladder from the exterior. Do NOT wring the fabric. Do NOT use dryer. Let it dry naturally. Once the exterior is dried, comb it, and insert the PVC bladder back inside (in reverse order of when removing it, legs first). 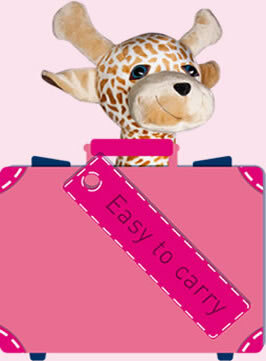 When deflated Bubby is very easy to travel�with (and even to stay in �no pets� hotels). The parents can easily carry their child�s 3ft Bulldog with them everywhere - in the car when�traveling, in an air-plan, and outdoors. When deflated Bubby is very efficiently and easily stored. 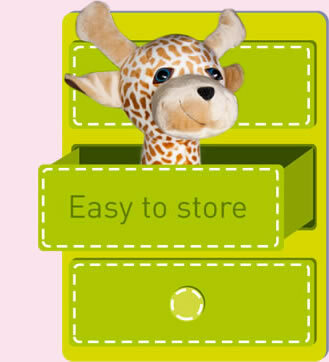 Suddenly a 6 ft giraffe can be stored on a shelf, or in the drawer. Remove the package, stretch and open the �Bubby� legs and hands. Close the zipper half way, while leaving the swollen valve visible and accessible. Inflate until desired volume is obtained (Max: 90% - 95% of capacity). Close the swollen valve and press it inside until it�s completely inserted inside the cavity. Close the zipper and enjoy your new buddy!